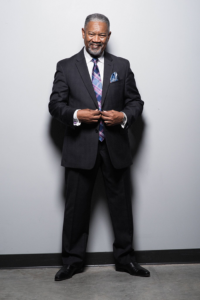 Husband, father, entrepreneur, business and community leader, Rev. Albert Moses, Jr. truly personifies the very qualities of a righteous and mighty man of valor. Born on July 17, 1956 in Baton Rouge, La, Rev. Moses yearned for a closer and more intimate relationship with his Lord and Savior Jesus Christ. As a child he began his journey to the center of the heart of God by preaching on the side of the very home that he was raised in; his church consisted of one member; his sister. In November of 2003 he became the pastor of Christian Faith Missionary Baptist Church of Port Arthur, Texas. It was there that he began his transition from being just a preacher to a Christian entrepreneur. Through the divine wisdom of God and the leadership of the Holy Spirit he and his wife set out into new dimensions of Christ. Both of them left their stable places of employment that they had for many years and founded Love At Work Academy, Inc. (L.A.W. Academy).It is a ministry for probated youth ordered by the court the opportunity for a second chance at success. With various programs such as truancy prevention, gang awareness, substance abuse awareness and character education it is a ministry where Love is the L.A.W. Throughout the trials and tribulations that come hand in hand with life also came the joys and triumphs of marriage and fatherhood. Rev. Albert Moses, Jr. has been married to Rev. Charlotte Moses for 30 years and has four wonderful children, Rev. Albert III, Ashton, Ariel and Aisha. He also has (1) Granddaughter, Audrina Jewelle Moses.